The Mexican American family live on the edge of a roundabout on a quiet street in El Paso, Texas. The houses on the street are identical, coated in the same shade of beige paint, like wet sand. Each house is almost indistinguishable from each other. They cross that border every week to spend time with family. She doesn’t worry about anything happening to their treasured weekly visits, despite the divisive politics of President Donald Trump. His presidential platform was largely founded on an extreme view of immigration. He believes undocumented immigrant cross the border and bring drugs and crimes. He wants a wall built along the border between United States and Mexico with strict rules on who can enter the country. But there’s already a fence in El Paso and a larger border patrol presence. Gabriela and her family have lived with that wall there for a long time, but she doesn’t let it divide them. The house has family photos scattered throughout, a wall was collaged with more. Some photos were adorned with saints or flowers next to them. Gabriela sat on her dinner table and did not stop smiling. She had just come back from the gym and was still wearing her sweats. “The good thing about El Paso is that you have the opportunities of the United States with the culture of Mexico,” she said. Moving to El Paso wasn’t a decision the family took lightly. When they moved, Juarez was very dangerous. Crime was rampant and they took refuge in El Paso. Fear drove them to El Paso, but it doesn’t keep them out of Juarez. “We have breakfast or lunch every week,” said Yaya, Gabriela’s mother, who was visiting. Yaya lives in a gated community in Juarez. The houses in her neighborhood all look alike too. They’re white with black metal accents. But unlike Gabriela, she knows all her neighbors. “Juarez is different because you know all your neighbors,” Gabriela said. “Here I can’t. Yaya was dressed in her pajamas, ready to sleep early. She said her neighbors in Juarez kept her awake because they had a party with a full mariachi the night before. Despite the occasional party, she said it’s very relaxed. Since everyone knows each other, they understand. Luis, Gabriela’s husband, crosses the border every day. He wakes up, takes his daughter, Regina, to school, and drives to his job in Juarez. Because he has to drop her off at school, he said it takes about an hour and a half for him to get to Juarez. To come back home, between 20 to 40 minutes, depending on traffic. When it comes to the border, traffic is what all of them complain about. Not the tolls, the gates, the security. The traffic. “Nothing has changed [with the family] other than the time it takes,” Luis said. The family has lunch or breakfast every week, just like they did when they lived in Juarez. Only now they stay over each other’s house instead of driving home. For Regina, Gabriel’s teenage daughter, the move meant sacrificing more time with her friends in Juarez. Regina has been going to school in El Paso since she was five, even while she lived in Juarez. Her mom used to drive her to school every morning from Juarez. A good education is more important to Regina than missing a few parties. Still it’s hard for her because of the distance. 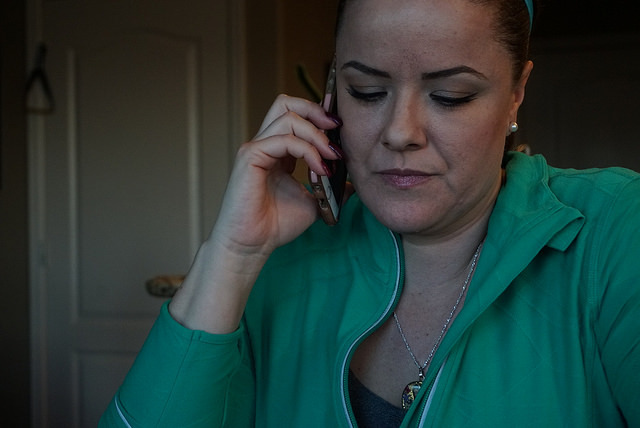 The amount of time it takes to get to Juarez makes it difficult for her to keep up with her friends, but despite this, Regina is happy in El Paso. The border keeps her close to her family and friends in Mexico. Nothing’s changed. “I don’t think it’s affected my life,” she said about moving to El Paso.